It’s no secret that today’s computing workforce is dominated by men. The St. Louis-based organization LaunchCode wants to change that. LaunchCode, a non-profit group working to deepen the pool of computer programming talent in St. Louis, has itself launched CoderGirl, an all-women’s computer coding initiative. This year’s program (the initial program was held last year) began Wednesday, January 14 and will continue Wednesday, January 21 from 6pm until 8pm at the Cortex Innovation Community office at 4240 Duncan Avenue in mid-town St. Louis. The group will meet weekly after that, at the same time and place. InnoVox STL: The first of these coding events for women took place last year, in May. Tell us about that event and explain how this event relates to that. Fondaw: Last year’s CoderGirl event was structured around CS50, Harvard and MIT’s online programming course. This year, we decided to broaden CoderGirl’s scope to support women of all skill levels and online learning programs, as well as women who are looking for a community space in which to work on their own coding projects. There are mentors available at our meetings to assist with specific programming questions, as well as serve as a broader network supporting women in technology fields. We still offer the CS50 course for our CoderGirls and recommend it to those looking to get a job as a developer. However, we also support a variety of other learning options for women depending on their goals, interests, and experience level. InnoVox STL: Why the need for a coding event specifically for women? Fondaw: Women make up only 26% of the computing workforce but women worldwide use the Internet 17% more than men and are avid users of technology. We want more women involved in building and creating the exciting new platforms and tools that shape our lives. CoderGirl offers a space for women to come and learn these skills in a supportive, welcoming environment. Our mentors are female developers working at a variety of St. Louis companies. Technology jobs are in high demand: according to the U.S. Bureau of Labor Statistics, an estimated one million programming jobs will go unfilled by 2020 nationwide. CoderGirl and LaunchCode have placed three CoderGirl alums in full-time jobs in 2014, its first year, with a fourth on the way. LaunchCode placed over 130 apprentices, both men and women, with St. Louis companies in 2014, and 90% were hired full time. 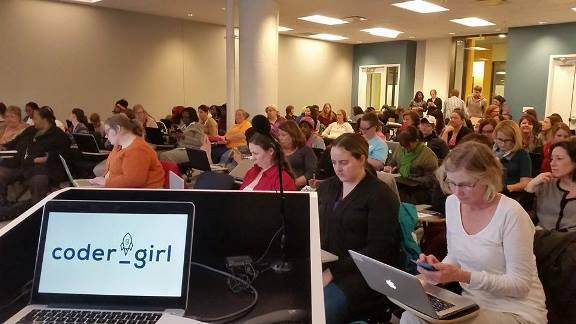 InnoVox STL: You drew a big, and pretty diverse crowd for last week’s CoderGirl kickoff. Is that what you expected? Fondaw: We have CoderGirls from all walks of life. There are recent college grads with degrees in things like environmental science, long-term unemployed people, stay-at-home moms looking to get back into the workforce, and more. We encourage anyone who is interested in learning to code to join CoderGirl. InnoVox STL: Is there a cost? CoderGirl is free and open to any woman with a laptop, preferably from within the last 4-5 years and not a Chromebook. Windows or Mac is fine, there is no preference. InnoVox STL: You mention that “no prior programming experience” is necessary. Can you walk us through that? What level of computer literacy need a participant have? Fondaw: Participants should have basic computer skills–the ability to type, copy/paste, and to search on Google. Other than that, CoderGirls just need to come ready to learn. InnoVox STL: Last week (January 14) was week one. How long need a participant take part until they reach the point where they might be employable as a programmer? It depends on a several factors, including how many hours a week you are committing to learning code. We’ve had some participants ready to be placed with LaunchCode in as little as three months. Others work with the group for a year and then get jobs. Everyone learns in a unique way and at their own speed–CoderGirl tries to support these different learning paths and provide options for all participants.